You can operate the power third seats when the shift lever is in P.
Before stowing or returning third seat, remove any items from the floor area to prevent interference with moving parts. 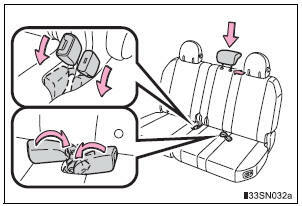 Lower the center head restraint to the lowest position and stow the seat belt buckles. Stow the center seat belt. Press and hold the stowing switch. A beep sounds twice to indicate the start of the operation. The beep sounds again twice when the operation is completed. Be sure to move the second seats forward from the rearmost position, as they may interfere with the third seats returning operation. Press and hold the returning switch until the seat cushion is locked. A beep sounds twice to indicate the start of the operation. The beep sounds again twice when the seats are locked in foldeddown position. Make sure the front and rear legs are locked securely. Raise the outside head restraints. If the indicator light above the switches flashes three times when the folding/ returning switch is pressed, the folding operation will not start. 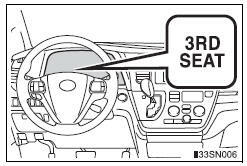 Make sure the shift lever is in P.
An object is caught between the seatback and seat cushion. The stowing switch is released. Other power third seat switch is pushed while operating the stowing switch. The shift lever is moved from P when the engine switch is turned to the “ON” position (vehicles without a smart key system) or IGNITION ON mode (vehicles with a smart key system). If the engine is started during operating, the seat operation may also be stopped. To continue the folding operation, the seatback must be returned to its original position first. The AUTO ACCESS SEAT cannot be removed. The warning light comes on if the third seat operation is not yet complete when the engine switch is turned to the “ON” position (vehicles without a smart key system) or IGNITION ON mode (vehicles with a smart key system). Be careful not to get any part of your body pinched by a seat. If the seat is reclined too far, the lap belt may slide past the hips and apply restraint forces directly to the abdomen, or your neck may contact the shoulder belt, increasing the risk of death or serious injury in the event of an accident. Make sure the seat is locked in place by trying to shake the seatback and lift up the seat cushion. Do not leave a seat in the vehicle if it has been disengaged from the floor. Do not sit on or place anything on a seat that has been removed from the vehicle. Make sure that the seat path is clear before moving the seat. Otherwise, injury may result from contact with, or by being pinched by parts of the seat. Manual third seats: Do not sit on the third seat when it is in the stowed position with the seatback upright. 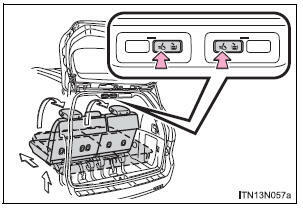 Power third seats: Do not continue the stowing operation when the indicator above the stowing switch and returning switch comes on or flashes. An object or a person may be caught in the seat. Power third seats: During the stowing operation, to prevent the vehicle from moving, do not shift the shift lever out of P with the engine switch in the “ON” position (vehicles without a smart key system) or IGNITION ON mode (vehicles with a smart key system). Make sure to leave enough space around the feet so as not to get them caught. Do not sit on the ottoman. Seat belts may not be properly worn which may result in death or serious injury. 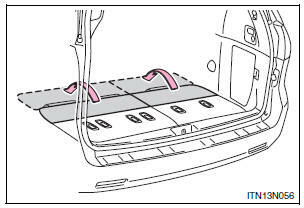 Stow the ottoman when you get in and out of the vehicle or when the ottoman is not in use to avoid stumbling over it. Do not use the ottoman feature when the vehicle is in motion. The ottoman feature should only be used when the vehicle is stationary. If the ottoman feature is in use during an accident the lap belt may slide past the hips. This could also result in restraint forces being applied to the abdomen or your neck may contact the shoulder belt, increasing the risk of death or serious injury. Avoid putting heavy loads on a folded seat that is being used as a temporary table. Do not sit on or put heavy loads on a second seat that has been removed from the vehicle. The metal tips of the seat leg may be damaged, preventing reinstallation of the seat. The second seats must be reinstalled in their original positions. If they are installed in the wrong position, the seat locks or bezels will be damaged. Make sure that the path the seat will move through is clear before stowing or returning the third seat. 8-passenger models: Be sure to raise the stowed second center seat above the outer trim, when removing from the storage box of the luggage room. Do not place any objects in the second passenger footwell that could prevent the operation of the ottoman. Do not place heavy luggage on the ottoman. Do not place anything under the ottoman when in use. There is a possibility that something may get caught and cause damage when stowing the ottoman.